Got Holly the Tolstoy book The Kingdom of God is Within You since she is on a Gandhi kick. This is the book that is said to have inspired Gandhi's non-violent protest of the British forces in S. Africa and India. ...[Tolstoy] had always been taught that Christ's laws were not practical, and so must be interpreted–in effect, circumvented. What he had been taught as practical was quite opposite in tendency: "I was taught to judge and punish. Then I was taught to make war; that is, to resist evil men with murder, and the military caste, of which I was a member, was called the Christ-loving military, and their activity was sanctified by a Christian blessing." Wow. I guess things haven't changed that much in these last hundred or so years. But I tell you, Do not resist an evil person. If someone strikes you on the right cheek, turn to him the other also. –Jesus of Nazareth, proclaimed by Tolstoy, lived out by Mohandas Gandhi. As a man, I believed him when he said he was moved to also do something about the Aids pandemic. I believed him. Listen, I couldn’t come from a more different place, politically, socially, geographically. I had to make a leap of faith to sit there. He didn’t have to have me there at all. But you don’t have to be harmonious on everything — just one thing — to get along with someone. I plan to post some photos later today or at least by tomorrow of our trek. Wow. What an exhilirating, tiring, beautiful time. 12 miles a day the first two days, and a six-mile finale on the last. Had some great talks with Will and Rose (and of course, Holly) and some other folks we met along the way. Probably the most curious conversation was one that we had at Foster Point–a viewing-spot where you can see most of the tallest peaks in SoCal–with this retired schoolteacher. He was originally from Scotland, but had spent decades in California, lobbying for 'rational thought'. He wore a shirt that said, "Keep Church and State Separate." I just asked him what his shirt was about and let him roll. He had a great deal to say about fundamentalist Christians and how evil they are, wanting to get their 'creation myths' into the classroom, wanting to 'hijack science', etcetera and onward. I asked him if he'd met any people of faith that were evolutionists, and he didn't even understand my question. He stood so blinded by his own dogma that he couldn't even see a possible resolve, or at least a plurality of opinions being valid. And that's what gets me. I hate–really hate–that Christians are typically so closed-minded, so neglecting of scientific data, so ir-rational, so brainwashed and dogmatic (with others' dogma). I can infuriate me. But to see the other side of the... shall we call them the 'fundamentalist scientific community'? or the 'fundamentalist left'? They can be equally dogmatic and ridiculous, holding that rational thought and science can prove everything... as if that would solve the world's ills! Come on. What about dialogue? What about listening? What about not being so brainwashed that you can't see straight? What about a plurality of opinions, or of approaches, or at least of perspectives? Can't we together work towards a more holistic picture? Isn't this the Kingdom of God? Science and belief, faith and works, heart and head... working together, in tension, but not against each other? Helping to bring balance, but working to not obliterate one another? Perhaps I'm to idealistic. I dunno. Well, it's 6am on Saturday, and we are leaving in about 30 minutes to head to southeast San Diego county to backpack for 3 days with some friends from Holly's work. 3 days on the Pacific Crest Trail, which is a trail that runs from Mexico to Canada. We'll just be doing something shy of 30 miles in this trek. Okay, time to finish packing. See you soon. Have a good weekend. If you haven't already seen it...Grocery Store Wars. Took this quiz, and I scored as Cultural Creative. Cultural Creatives are probably the newest group to enter this realm. You are a modern thinker who tends to shy away from organized religion but still feels as if there is something greater than ourselves. You are very spiritual, even if you are not religious. Life has a meaning outside of the rational. Found this in studying for my Semitic Religions Final today. In the Resurrection of the Dead, the Sunni believe that Jesus will be the Leader, and the Shia believe that that the 12th Imam Muhammad al-Mahdi who is in Heaven will come back and lead the world. Fascinating. I have never heard this. Anyone else? One of my favorite albums. 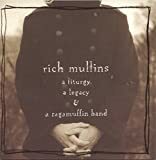 If you don't get Rich Mullins, that's cool, but he was such an inspirational Jesus-follower. Shalom (wholeness, 'things set in their proper place', peace) on one ankle and broken on the other. I walk with both feet. I am both a part of the problem and a part of the solution. I am a failed dreamer, a hopeful cynic, a loving hypocrite. I am the problem with this world: my selfishness, my lack of self-control, my anger. I am also an active participant in God's mission/dream to heal this world... and so I bring goodness to this world as well. Yes. Good. Now if we can only get ole Scandrette to get his book going. So, yesterday in my World Religions class, we discussed Islam. Sad that we had to relegate the 2nd most populous religion to a one-day lecture, but oh well. First, and I had heard this before, but... Allah is simply Arabic for God. The God worshipped by Muslims is the same God YHWH that is worshipped by Christians and Jews. Second, Islam simply means 'surrender', as in 'surrender to God' and a Muslim is 'one who surrenders to God'. This gets into the point of Islam. Islam as a movement developped in the 7th century even though it traces itself to Ishmael and refers to itself as the true of the Semitic (of Shem) religions. The point of Islam was a sort of reform of the Semitic traditions. It upholds that God had spoken through the Prophets and through Christ, but as time went on, these revelations had become distorted. The notion of Jesus as God (which remember, was not arrived at until the 4th century) was simply blasphemy. Islam, as Judaism, was strictly monotheist. The notion that God could be summed up in any single image (person or thing) was the highest heresy and deservable of death. Muhammad, after the angel Gabriel had pressured him into it, transcribed the Koran... directly, word for word, from God. A friend comments that this sort of 'transcription' might have sent ripples over into Christianity, and with heightening during the crusades, caused the Christian tradition to adopt a similar sort of 'transcription'... at least a soft one. At any rate, Islam was a movement formed to 'reform' the Semitic tradition... to restore it or put things in proper places (sound familiar?). In fact, the Koran references Jesus more than Muhammad and says to read the Bible if more information is needed. Islam's aim was to return, to surrender to God. The root for Islam actually is a word that means "peace". Interesting, no? I know this is still a ways off, but you should check it out. It is an amazing time in the desert, talking about God, life, politics, love for churchwork, disdain for churchwork, new views on churchwork, etc... It has made a huge difference in our lives to be a part of this network of friends on an annual (and often times more) basis. Been listening to these talks by Walter Bruggemann and NT Wright. Incredible. This next Monday at our place, in leiu of finishing our book club, I will be presenting the notion of moving from the dominant American script, which is consumerism, to the script of the Kingdom of God, which is contribution and redemption. So I am stealing a great many ideas from these two great thinkers as well as borrowing some from Brian McLaren. If you are in the Southern California area and have no plans for next Monday night, join us. Help Bring the End Times!!! Woo hoo!!! Thanks to Rick for this ridiculousness. Tired of Waiting on the Rapture? From my local paper, in St. Pete, a local pastor is tired of waiting for God to bring about the end times. So, his church is raising money to send Jews to Israel, in hopes of forcing God's slow hand. If I am a part the Kingdom of God, then I am part of a monarchy, not a democracy. What the King says goes. I have been pondering the implications of this for a little less than 48 hours. Of course, a monarchy is a bit of a foreign word for most of us in the States... or really, most of us that are even in constitutional monarchies... those are what I would call a 'soft monarchy' where the monarch is not really the authority, but rather a figurehead. I think that Jesus probably used the notion of Kingdom (as opposed to the Platonian Republic or the Roman Empire). You see, even in the Jewish context, the other governments would have made sense in the metaphor, but the ultimate authority came from the King, hence a monarchy. I think what began as a Monarchy of God (does this sound archaic or what?!?) has turned into the Constitutional Democracy... or a Constitutional Monarchy at least. You see, in this kind of government, a constitution or a document rules a people. There is no person that can rise above the text that is the constitution. In a Monarchy, the King is the rule... which, of course, can be very dangerous if the King is not looking out for the good of the people. But in the economy and government (metaphors, mind you) that Jesus was speaking of, there was no text that the King could not rise above. I think of this in the way so many folks 'worship' the Bible, almost as if God is bound to the stories in those pages and cannot exist elsewhere... nor can s/he have any different aspects of character that are not covered in the Book. So, it's as if the King is bound to a constitution. Do you ever wonder how our world/culture/whatever shapes what we think and how we think things should be? Like the fact that I am questioning power structures probably is because I am at least somewhat informed by other question-askers and that sort of skepticism is valued in the circles in which I run. But also, living in a Constitutional Democracy (or is it a Monarchy? I forget. ), some people might not realize what they are adopting in other social structures, like the church. The metaphor of God as President is very different from God as King. Do you see? Don't ever vote for me if I run for office. Knowing me to be the hypocrite that I am, I bet I would for-go my inspiration/education theory and slip into the authoritarian to get things done. In the 6th centure BC, the nation of China was in chaos and several people sought to create harmony in their world. Of these, there were three main sects or schools of thought: Legalists, Confucianists, and the Taoists. That is a historical oversimplification, becase these three groups developped at slightly different times and in slightly different places and in slightly different ways... but still, there were these three main schools. The legalists said that man is basically corrupt and that law is the only way to bring order and harmony. Because man behaves badly, the government should create more laws to restrict this sort of behavior and that would bring about peace. The second school was on the opposing side. They were the Taoists. They believed that people were by nature good and that if left to their own devices, they would do good. If they were free, they would act properly. It was society that was corrupt because it tried to hard to 'force' things instead of just letting them happen. A third school was the school of Confucius (Kung Fu Tzu). He said that rules aren't so bad, but they do not 'make people good'. In fact, people were already good, and rules helped keep social order, but education was the key to helping people cultivate themselves and therefore create a better society. You see, everything in Chinese thought was based around the good of the whole society, not just the individual. I find these three perspectives very insightful as we look at our current global state of affairs. Here we are, 2600 years later and still looking for harmony. And I find even more interesting, the ways that we as individuals, as a society, and as a human race, can go with this. Some folks believe that the only way to make people better is to legislate morality and create new laws. They also value authoritarian leaders... in churches, in government... perhaps even in relationships. They might applaud our President because he is such a strong man making a strong presence... setting things straight o'er there in the Middle East. They might also value other people making strong decisions for them. What strikes me as odd about this perspective is that is it is constantly reliant upon society to build these universal rules while neglecting the exception to the rule. It also assumes that people change best from outward things, not inward things. The third school is the one that resonates most with me. Sure some laws are necessary to look out for the common good, but generally people will do well if they are educated to cultivate virtue in their lives. Wasn't it Machievelli who said that the greatest sin is ignorance? I'd believe it. I think of how many people that, if asked if they'd like to be a part of changing the world for good, would answer, "yes," but they have no idea how to. I sure as hell don't most of the time! Anyway, the song "Changes Come" just seemed to sum it all up this evening. God, hearing it tonight made nearly cry. As in a blog-hiatus... Haven't posted much lately. Been busy with different work projects. One that I am pretty proud of is my production a band called Everyday Collision. You can hear some of the 'almost-final-mixes' from their forthcoming album by clicking here. Pretty good original tunes. And my wife, Holly, did the art... amazing stuff. Thanks to Will for his latest post. I think it might be worth your time if you are interested in hearing some troubling information about US prison stats/systems/etc. Great quote below in reference to how the Gospel and the US interact. There are many who believe that the message of Christ is designed to make them and their children safe. I am not sure where someone would get that understanding from, but I do tend to wonder about someone whose theology is based on safety, comfort or contentment. I find little in the message of Christ that causes me to believe that I will not have to be involved with 'them', whoever you tend to define 'them' as. The United States says it has regained the capability to make nuclear weapons for the first time in 14 years and has resumed production of plutonium parts for bombs. I looked for this because NPR did a short piece this morning on the hypocrisy of how the US is demanding the ceasing of Nuclear proliferation for other 'dissenting' nations, but as for the US, it's okay to keep right on building them. Why? Because the US is the 'Good Guy', right? Could you imagine what would happen if the US said that instead of forcing others to give up their creation of nuclear weapons (which is very important, too), the Bush administration for called for a dismantling of all the US atomic bombs? Wow. For those of you who may not know it, in recent worldwide polling, the US is considered a bigger threat than any other country. I think it's time that is listened to. We have been reading A New Kind of Christian for our book club that meets at our house. It is my fourth time reading it, and it still touches me. "Whenever I get to know individual non-Christians--I mean really get to know them--I am completely convinced that I find God already there and at work in their lives...So it's clear to me that God doesn't limit himself to working in Christians' lives." For many of us, this may land with a 'duh', but for many of us in the evangelical and post-evangelical world, this may need to be heard. We seem to build theologies based on our felt and perceived needs, don't we? Now, I'm not saying that we don't pull things from sacred texts or communally consider things, but often times the starting place is our own need to have certain questions answered, mysteries explained, or needs met. And perhaps this is not such a bad place. It is, perhaps, where we must begin. But still, if we are not intact with other things than our own felt needs, we will fall into delusion and myth-making. This is why community past and present, near and far, is so important. The entire human family is important. Some people opt for stopping in the Semitic traditions, thinking that others are not worthy of being consulted. Worse yet, some stop with the Roman Empire's creeds as if Constantine's Councils were able to cement a universal understanding of God. Keep seeking. Keep looking. Keep listening. But do not just form your own opinions in a sort of individualistic, me-and-God-and-no-one-else sort of way. Understand that truth is most often found in communal truth, not individual truth. Or at least know that I understand it that way. Narnia trailer. I was almost moved to tears seeing Aslan. Incredible. I cannot wait. Thanks Rick for the cool quote. French writer Andre Gide said, "Man cannot discover new oceans unless he has the courage to lose sight of the shore." Thanks to Chris for sharing this quote: "...Probably the most urgent question now faced by people who would adhere to the Bible is this: What sort of economy would be responsible to the holiness of life? What, for Christians, would be the economy, the practices and the restraints, of 'right livelihood'? I do not believe that organized Christianity now has any idea. I think its idea of a Christian economy is no more or less than the industrial economy--which is an economy firmly founded upon the seven deadly sins and the breaking of all ten of the Ten Commandments..."
My friend Will has this on his email signature. One of my favorite quotes. So, I was thinking this morning in the shower about that word..."sin"...and how it was actually just a metaphor for our condition (and by "our" don't just read "me and my own personal, isolated condition") as part of corrupt or fallen or broken creation. You see, the notion of sin in the New Testament-speak was to miss the mark. This is not all that different from the Buddhist understanding of Dukkha... suffering, brokenness... basically, the opposite of "shalom" which means wholeness and complete-ness. So many people get so caught up in "sin" being a part of the "gospel" and forget the metaphor it plays. Most people recognize that there is brokenness in this world; the gospel says that we are in part to blame...and that we can move from the side of "part of the problem" to the side of "part of the solution"...while still remembering that we will always be part of the problem! Now perhaps that is oversimplified, but I had to get it out there...and I am quite sure that there is not a single original thought in this post...or in most of my posts! but there it is. Ciao. Zoroastrianism: "Of all the other nine extra-Biblical living religions, Zoroastrianism is the only one from which a definite religious belief has been borrowed and included in the Bible. Consistently throughout the Old Testament down to and including the Isaiah of the Exile, the ultimate source of everything, including evil, is represented as the God Jehovah. But a distinct change took place after the Exile. A comparison of two parallel accounts of a certain experience of King David will show that a post-exilic document (1 Chronicles 21:1) substitutes 'Satan' for 'Jehovah' in the pre-exilic account (2 Samuel 24:1). Thus Satan is not an original feature of the Bible, but was introduced from Zoroastrianism." Had some interesting conversation about this in my World Religions class today. Most people who know a bit about Christianity seem to disregard the history of the religion, thinking that the way it is now (or the way it was in 4th Century or at the time of the Reformation or at the time of America becoming a nation) is the way it has always been. Attributing theological notions to places outside of the Judeo-Christian tradition does not cause me to doubt God or not want to follow Jesus. In fact, it allows me the thought that (here it comes... dun, dun, dun...) God was at work in other traditions around the world. Chew on that one.